How does Australian Cartoonist Gary Clark so easily take one duck and give him loads of personality that has you laughing and smiling from page to page? Ding Duck I Want To Fly! is a book that entertains the young and the old. I definitely had to fight my household during the review process to get access to the book. Every time I placed it on the table and left the room I would return to the sound of snickers from the office chair as someone had ‘jumped in my grave’ to get their part of Ding. Even my 5 year old loved the adventures this cute, yet rather daft Duck provided. Ding Duck definitely stands in a league of his own. After 30 years will he ever fly successfully? To be honest with you I have never been into cartoons. As a child the cartoon section of the newspaper really never held my interest. I was quiet willing to let my older brothers have them first. In later life I found myself in love with a man who is not only an artist and cartoonist but also an aviation nutter. I was soon put in my place. As time has progressed I have found myself involved in a world of visual characters that charm and entertain and a world where my feet are not always on land. Ding Duck I Want To Fly! was my initiation into the world of a comic books. In Ding Duck I Want To Fly! Gary Clark gets your imagination and visual cues stimulated with a Ducks eye view of the Swamp on a typical day. Bright, busy and comical the reader is taken into the world of the characters, followed by a brief introduction to the Swamp Support Cast and Aircraft within. For a novice like myself I enjoyed this initial journey. I went into the rest of the book feeling like a Ding Duck pro. 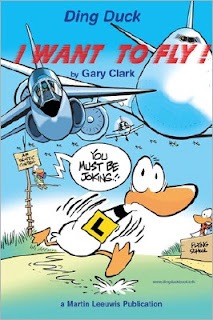 Gary writes “ This book is a snapshot of the wonderful and diverse world of aviation...It is about Commercial Air Transport, Military Jets, Helicopters, Aerobatics, General Aviation, Recreational Flying, and ....Duck. Mostly it’s about Duck aviation...In particular one unique Duck named Ding. Despite receiving over 5000 flying lessons and many attempts, Ding Duck still can’t fly. But that doesn’t stop him trying and failing and trying again. The Swamp that Ding calls home features two good runways, an Air Traffic Controller, a Flying School and a host of other assorted wildlife including all the other Ducks who get to do what Ding is hoping to do himself one day...Fly South for the Winter with all the other Ducks. As you follow Ding’s daily life cycle of flying attempts, failures, flying lessons, theory classes, exams and everything else that goes on in this feathered parallel world to the other less natural , mechanical form of aviation you will discover a wonderful truth: There is little difference between these two worlds and there is much humour to be enjoyed in both." It seems Gary Clark knows his work well. If there is a word stronger than humour then it would refer to the work of Gary Clark and Ding Duck. From the beginning to the end of laughed and Ismiled. There is no feeling down in the dumps when Ding is around. This duck has stolen my heart. He is cute, determined and doesn’t really need to do or say much to have you wondering about the logic of life. Ding is a Duck that has something to say that will touch a nerve in everyone. Having no aviation knowledge, except for that of the fact that planes take off and land, I still found myself welcome and with friends when visiting the Swamp. Ding Duck I Want to Fly! is a beautifully presented, high quality A5 publication. Its glossy colourful and humorous cover welcomes all that hold it. The professionalism and understanding of the industry by publishers Martin Leeuwis Publications, who have been publishing books with aviation humour, anecdotes and cartoons since 1982, shines through. My copy has been used and abused over the last few months yet shows no sign of wear and tear. The quality of the book meets the quality of the contents making the overall reading experience enjoyable. At 160 pages and with a recommended retail price of $18.50 it is money well spent. I couldn’t put Ding Duck I Want To Fly! down, finishing it in one sitting and being left with wanting more. It was nice to have a book that the family could discuss, share and laugh about together. My 5 year old already had her heart set on being an artist like daddy and Ding Duck and Gary Clark have certainly enhanced that dream, whilst introducing her to the world of reading and books. This book has left me envious of Gary Clark and subscribing for my daily Swamp email. Guess who is getting Gary Clark Ding Duck Aviation products for his birthday and Christmas? Oh and I think I have found just the spot on a wall in my house for the Ding Duck About To Fly framed print or comic strip signed by Gary Clark.